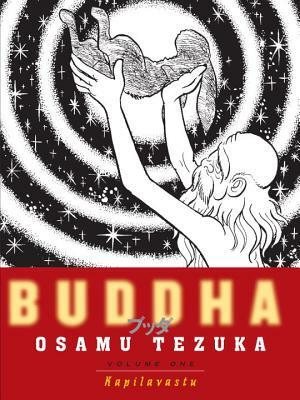 Osamu Tezuka is best known as the writer of the universally acclaimed (though I’ve never gotten around to reading it) Astro Boy, but I’ve seen Buddha on the comics shelf at the library for years and just decided the other day to get into it. It’s the story of the Buddha, Siddhartha Gautama, and his journey to enlightenment. At least, as far as I know: I’ve come to the story knowing very little about the Buddha except that he’s the founder of Buddhism, he grew up a prince, and he’s not the fat smiling guy. And he only appears in the first volume, Kapilavastu, toward the very end, when he’s born. None of this is to say that it’s a bad book or that I was disappointed in any way. Quite the contrary: I greatly enjoyed reading the story about Chapra, the slave boy, his mother, the monk Naradatta, on a holy mission, and the pariah Tatta, and their adventures through India as their fortunes change. In fact, I’m not sure how their stories will intertwine with Siddhartha’s, but I’m excited to find out how they do in later volumes. I’ve read one story by Tezuka before: Ode to Kirihito, which is a story about a doctor who goes to investigate a rare disease that makes people look like dogs, but gets infected with the disease in a complex political conspiracy. It was a strange but gripping story, and Buddha looks like it’s going to be similar. The art style in both books is humorous and beautiful: some pages in Buddha have so much detail it’s like looking at a work of art, and there are some site-gags too, like the author inserting himself in a cameo and some fourth-wall-breaking commentary. Maybe it’s the language difference, but I thought some of the jokes fell flat. However, they didn’t detract from the rest of the book. Much has been made, as well, of Tezuka’s cinematic style of paneling, and I agree. Some fight sequences read as though they’re moving in real time, like a movie. Overall, I’m pleased with the first volume of Buddha and looking forward to reading the next seven.